NAHB recently released an on-line tool that provides economic and housing statistics for all local associations. The tool allows users to easily compare local area statistics to other associations, state and national figures. In addition to providing members with information on the local market, executive officers may find this tool helpful when responding to requests from local media. The statistics provided are NAHB tabulations based on an aggregation of county-level data from the 2012 American Community Survey (ACS) and 2013 Building Permits Survey. The ACS and Building Permits Survey are conducted by the Census Bureau. The tabulations are based on the latest available data. The NAHB tabulated statistics are discussed below. Share of Homes Recently Built – The share of new owner-occupied units is calculated by taking the total number of owner-occupied housing units built since 2000 divided by the total number of owner-occupied housing units. The number indicates how fast the stock of owner-occupied housing is growing. The higher the rank, the higher the share of homes built since 2000 compared to other HBAs. Higher shares are indicative of faster growing, more recently developed areas while lower shares are signs of areas with slow or little growth. Single-Family Permits Percent Change – The figure is calculated using the annual statistics for single-family permits issued in 2012 and 2013. The higher the rank, the higher the percent change in single-family permits issues from 2012 compared to other HBAs. 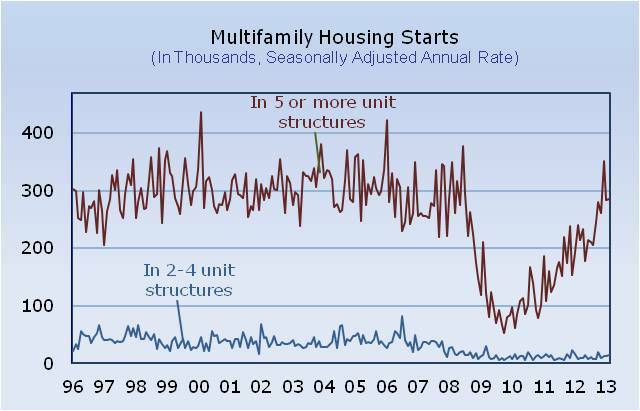 Multifamily Permits Percent Change – The figure is calculated using the annual statistics for multifamily permits issued in 2012 and 2013. The higher the rank, the higher the percent change in multifamily permits issues from 2012 compared to other HBAs. Rank – The rank of the HBA in each category is out of a universe of 673. In March 2014, NAHB published a special study allowing readers to compare local housing markets. The level of geography selected for that analysis is referred to as metropolitan area. The metropolitan area is also an aggregation of counties that share a local labor and housing market based on local commuting patterns. This tool complements the special study and is meant to provide another cut of the local housing market. In September, the (seasonally adjusted) annual rate of starts in buildings with five or more apartments was 260,000, according to the latest release from the Census Bureau’s Manufacturing and Construction Division. This is up 25 percent from August, and the highest the five-plus starts rate has been since September of 2008. To illustrate how far the market has come from the recent historic trough, 260,000 is two and half times the total number of five-plus units started in either 2009 or 2010. Also in September, the seasonally adjusted annual rate at which new five-plus permits were issued increased 23 percent to 323,000—the highest the five-plus permit rate has been since June of 2008. The backlog of unused five-plus permits still in the pipeline at the end of September was 46,600 (not seasonally adjusted). This is down fractionally from the August number, which was the highest the backlog of five-plus permits had been since early 2009. 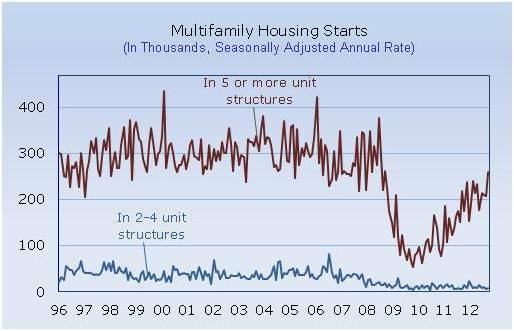 The strong permit numbers are an indication that multifamily production is likely to be relatively healthy over the next few months, and that a five-plus starts rate as high as 260,000 may be sustainable. For those interested in how much employment is being sustained by apartment production, the number of five-plus units under construction has been edging up steadily and at 226,000 is now the highest it’s been since October 2009.